Check out more images in our Photo Gallery. OK, we're getting a little gun-shy about making plans! As you've heard us say before, our plans are written in sand at low tide. But it seems that as soon as we write down any so-called plans, things start to go sideways on us. And this spring was no different. 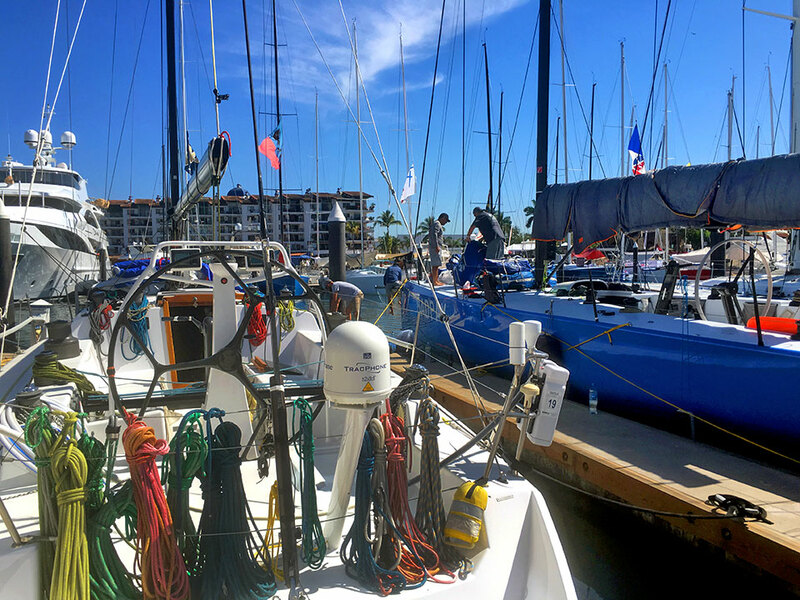 If you read our last post, we were planning to race Due West in Banderas Bay Regatta, and then head back up to the Sea of Cortez for a few months this spring. But the week before the regatta, just as MEXORC (another regatta) was happening here in the bay, Kirk found himself back in the hospital again due to an intestinal infection combined with electrolyte imbalance. No bueno! While it was a significant ordeal at the time, thankfully he's made another full recovery and we've learned a LOT about our own physiology, and vitamin and mineral deficiencies in the meantime. We've also learned about the MTHFR gene mutation (that may have played a part in causing Kirk's stroke last year), and that as we age the body doesn't always absorb all the nutrients it used to. Add to it all, that as soils become depleted of minerals many foods are much less nutrient rich than they used to be. Heidi wrote about all this on her Happy Well Lifestyle blog, which you can read here: Vitamin & Mineral Deficiency: Are You Deficient? If a holistic health coach and Capitán Kirk can be deficient, anyone can be. 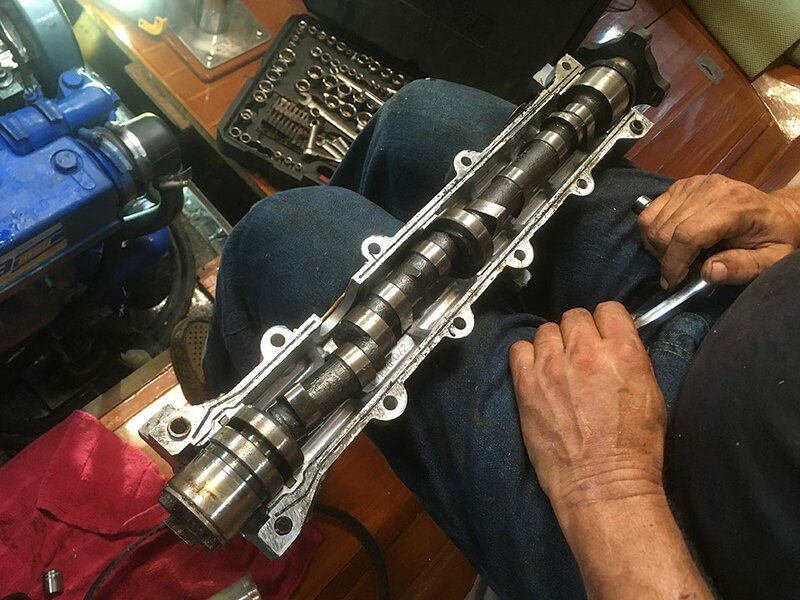 So we hope our experience and this article can help some of you. As you'll learn from Heidi's recent articles, we found that we're both deficient in several key nutrients--vitamins and minerals, plus protein. So along with taking supplements to help get our nutrient numbers back up more quickly we've had to become omnivores again. This dietary change hasn't been easy on us after being vegetarian/vegan for 30 years (Heidi) and 45 years (Kirk). 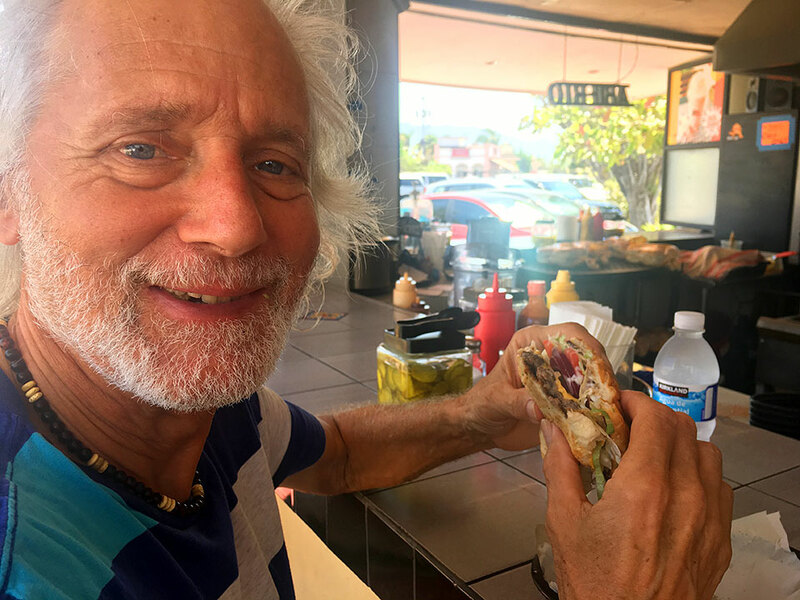 Happily Kirk is thriving on eating meat and says he feels 10-years younger in just a few weeks! The jury is still out for Heidi, but she's sticking with it for now. As Gandhi said, "Be the change you want to see in the world", and we have a lot of change left to affect in this lifetime. So although we both became vegetarians for ethical reasons, if we need to eat some meat to help us get healthy again, then that's what we'll do...for now. 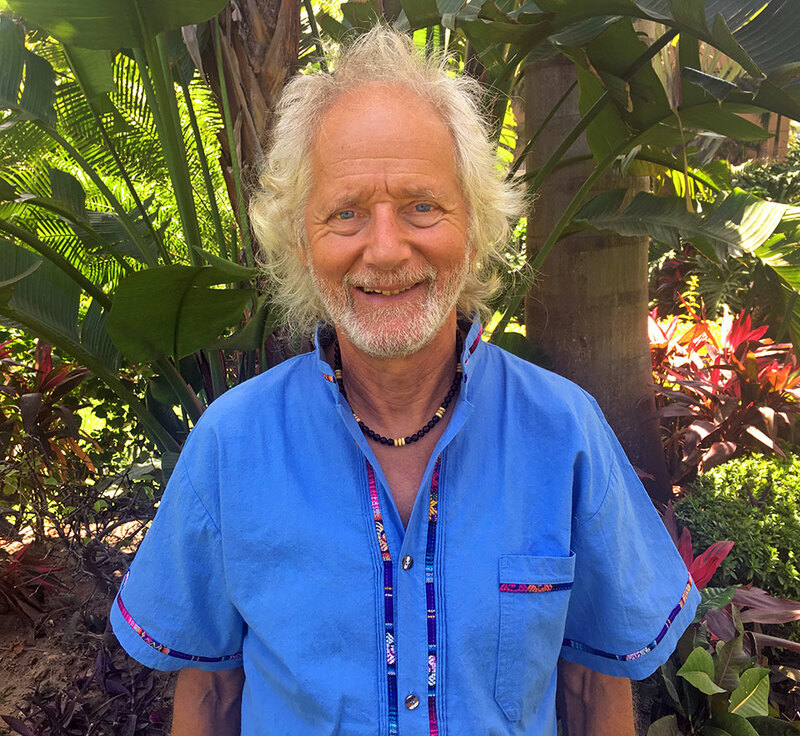 Meanwhile, after 45-years as a meditator, and six-months of studying ancient Indian Vedic wisdom through the Chopra Center in San Diego (online), Kirk has just graduated as a Primordial Sound Meditation Teacher. Over 40-years of scientific research has shown that meditation is an effective way to reduce stress, improve health, and enhance intuition and decision making. Kirk is excited to teach anyone who wants to learn mantra meditation or deepen their existing mantra practice, so let him know if you're interested. He will be teaching online via Zoom, and in person where ever we are. Heidi is continuing to grow her online wellness business, HappyWellLifestyle.com, and is super-excited about adding I Thought of You, fair-trade and sustainable jewelry, gifts, and accessories to her online shopping experience. Each purchase creates the opportunity of food, water, shelter, education, quality of life, and dignity to people in developing countries around the globe. I Thought of You dovetails perfectly with Neal's Yard Remedies organic, fair-trade, sustainable health and beauty products. Please take a look at these awesome products, and consider shopping with Heidi for Mother's Day gifts...it supports a great cause. In addition to her own blog, she's also ghost-writing and freelance blogging for several other companies. 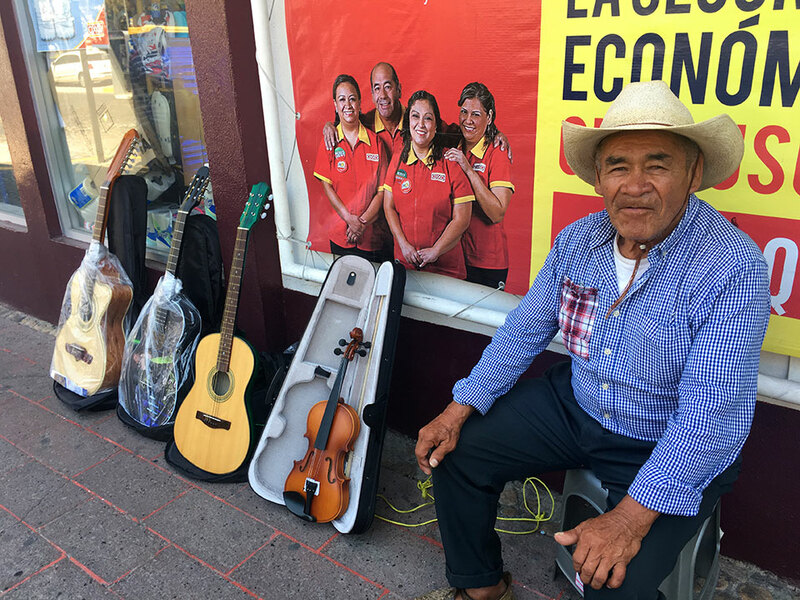 Oh, and she couldn't resist picking up a Dos Piños guitar at the market from this nice old Mexican guitar-maker...now she just has to remember how to play. It's been about 35 years! So great to see Jimmy & Robin, has it really been 20-years since we'd first raced together on s/v Charisma!? We've loved all the visits from friends and family this winter and spring. So much fun to hang out with our tribe, sailing framily Frosty & Patti, and April & Zak, and we're looking forward to seeing John & Carol here soon too! 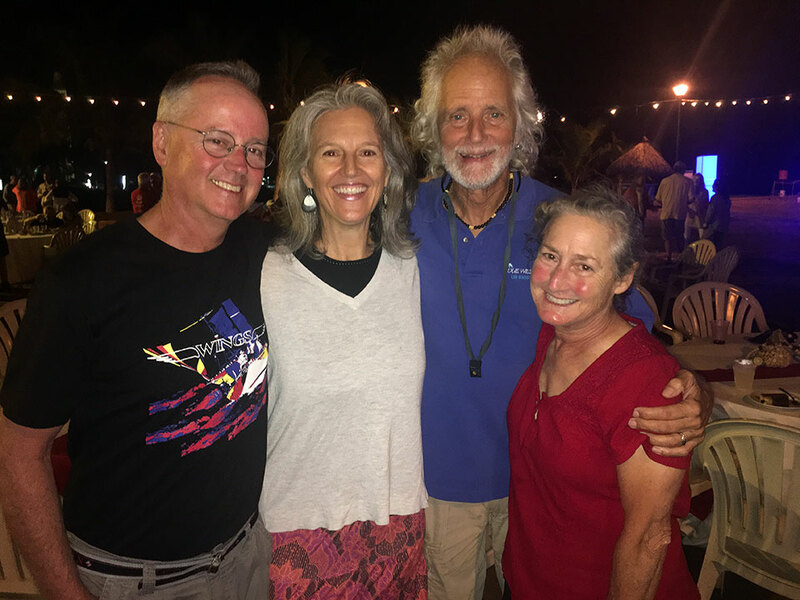 Our long-time racing friends Jimmy & Robin were here for Banderas Bay Regatta. Gratitudes to Kirk's old work buddy and mentor Roger and his wife Kay who kindly brought down our mail and some Amazon.com items from Seattle when they visited last month. 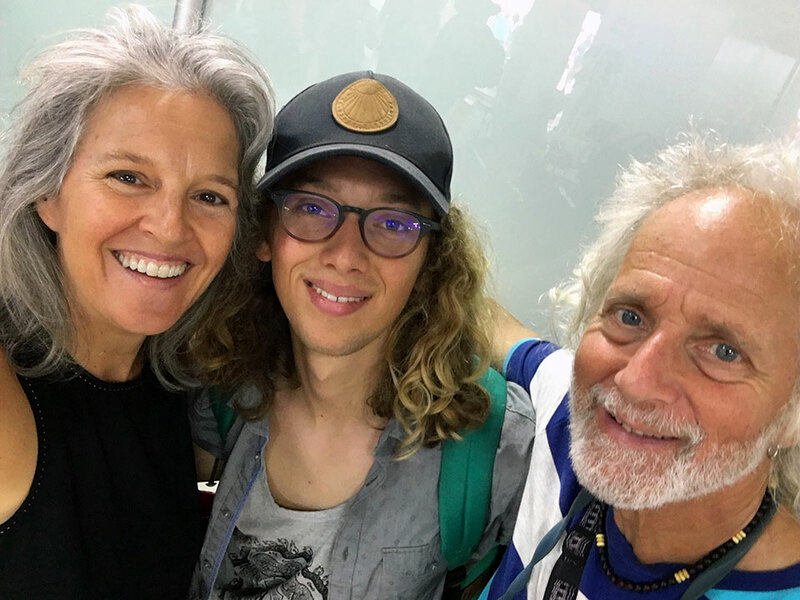 And we loved our quick hug and lunch at the airport with our nephew Tate and his Dad Mark when they flew through on their way to Sayulita. Kirk also had a couple of high school friends visit PV, and it was fun to meet up with them as well. Puerto Vallarta is a mecca for people from the Pacific Northwest, and as we were waiting for our nephew at the airport, we randomly saw another Seattle acquaintance who happened to be on his same flight. Great to catch up with our nephew Tate as he backpacked through Central America on his gap year. Check out this cool experiential program Carpe Diem Education that he participated in volunteering in several countries. 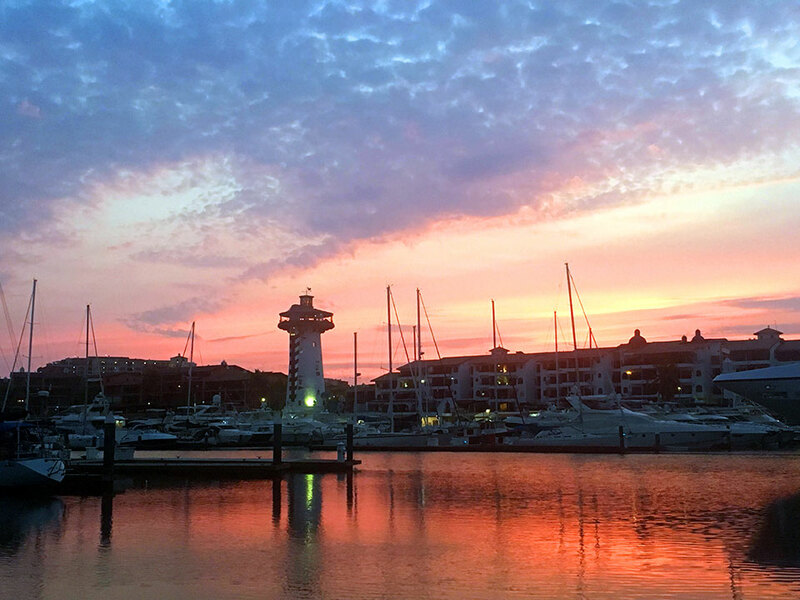 Spring is the time of year that sailors typically leave Banderas Bay to continue cruising. 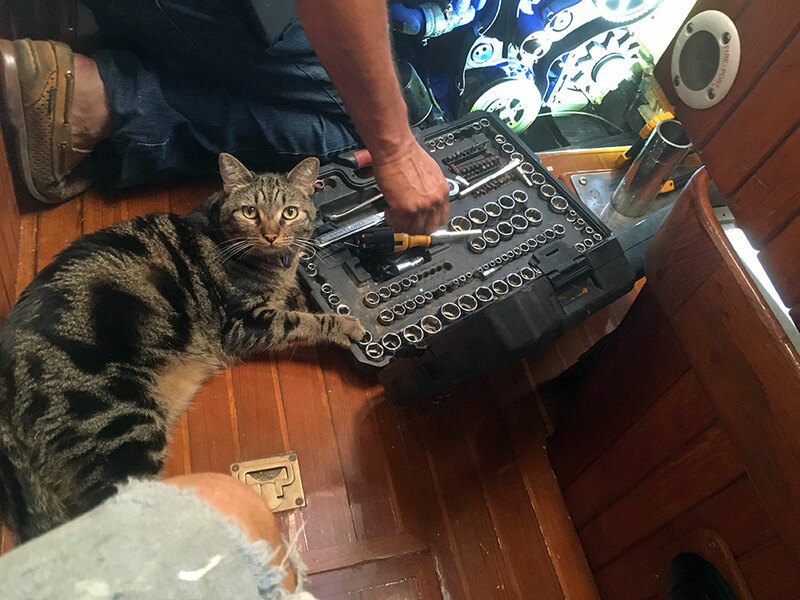 Many of our close cruising friends have set sail across the oceans, to the South Pacific, and the Caribbean, or back north to the Sea of Cortez before hurricane season starts up. One of the difficult things about the Cruising lifestyle is always saying goodbye as friends sail off to distant lands. But thanks to the Internet, we can keep up with them via their sailing blogs and social media. 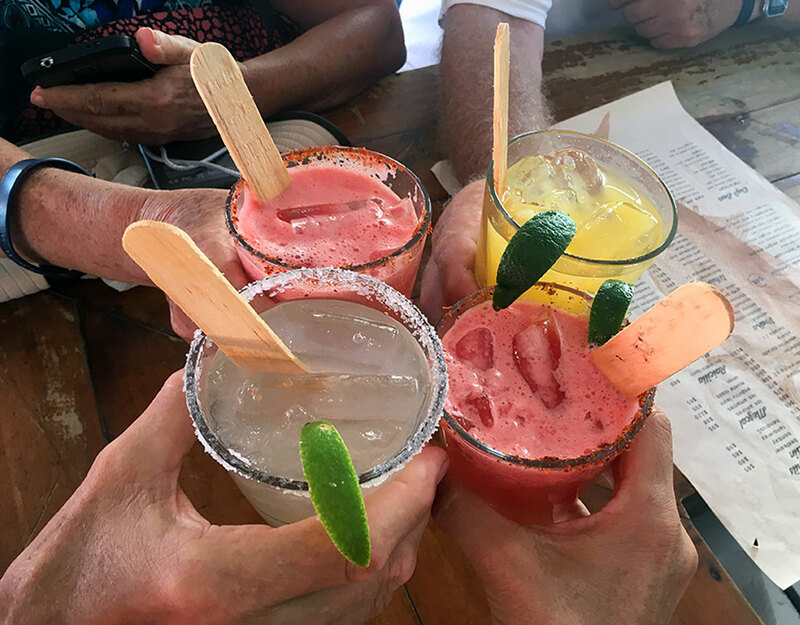 And a few friends are summering in Banderas Bay as well. 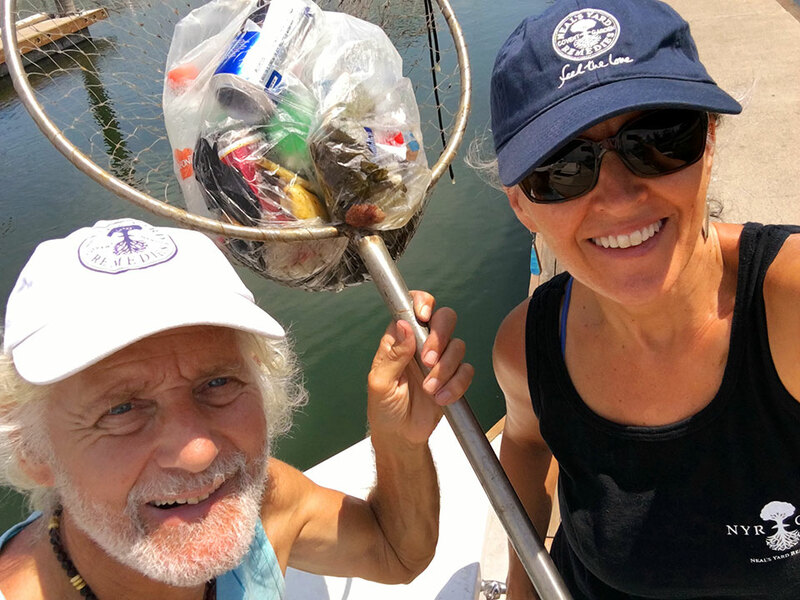 To celebrate Earth Day we started the day with 22 Sun Salutations, then walked the docks at our marina scooping out lots of trash with a fish net. Although there's certainly some intentional litter, the majority of litter in the marina comes from people setting plastic cups or water bottles on the dock, likely intending to take them up to the basura (trash), but invariably the wind blows them into the water first. So we always carry a trash bag with us walking the beaches and pick up trash when ever we can. Mexico is a lovely country full of brilliant colors, delicious food and drinks, and wonderful people and festivals...but also a HUGE plastic problem. At least many local restaurants are doing their part to stop using plastic straws. Americans use 500 MILLION plastic straws a day, and many of those end up in the ocean. So if you must use a straw, check out this cool re-usable straw that fits on your keychain! A refreshing reward (sans-straws!) at El Barracuda with Judy & Paul, after a walking the beach, picking up trash. 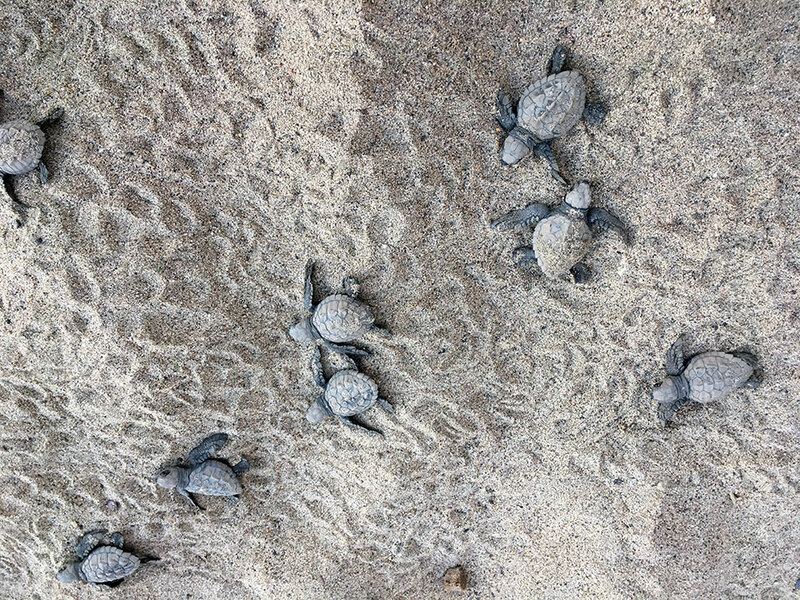 We'll be condo-sitting for friends on the beach again this summer and are looking forward to our daily beach-walks, watching sea turtles hatch, and picking up more trash along the way. 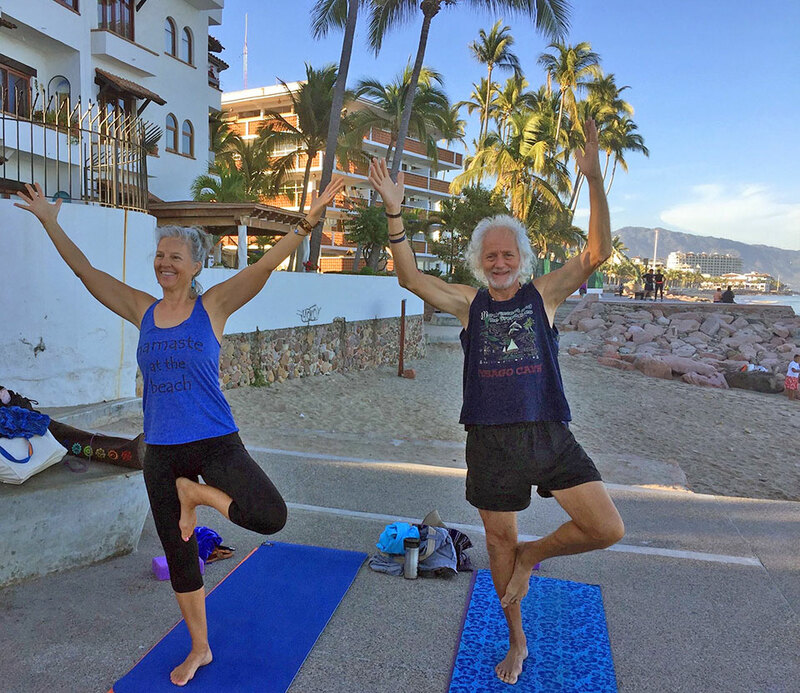 We LOVE our yoga practice at the beach three times a week, plus Pilates reformer classes which are the best workout we've ever done. A Pilates reformer class is a must-try if you really want to get in shape! We still hope to sail south in November, but we don't want to jinx our plans, so you didn't hear it here. Happy Spring to all of you. 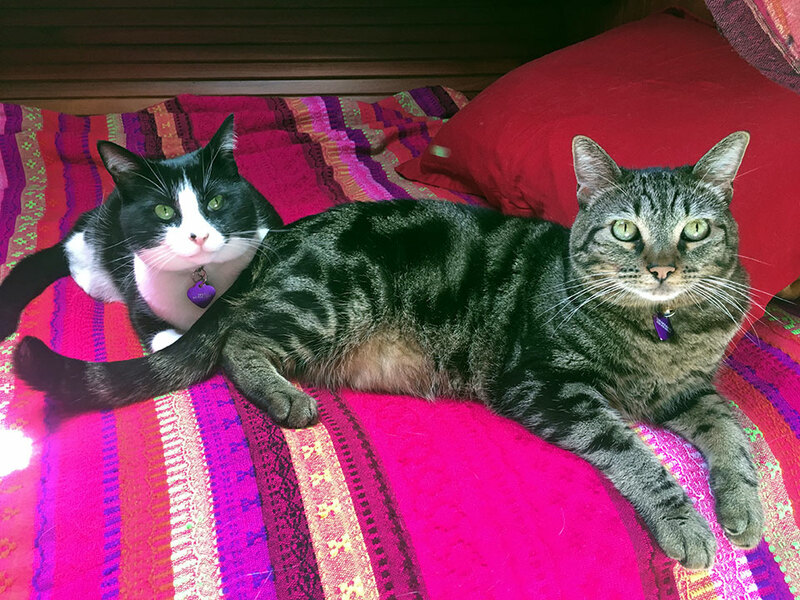 Tikka and Tosh would love you to come and visit any time, PV is a wonderful town!